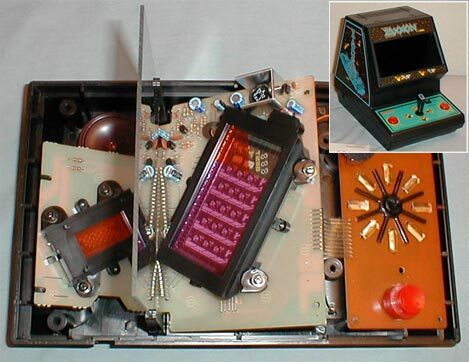 Halloween seems like the perfect time to feature gory snapshots of eviscerated electronic games. In an attempt to ward off the ghoulish ghosts of needlessly slaughtered electronics, we present Handheld Museum's Game Guts! page. This blasphemous collection features the mysterious innards of dozens of classic handheld and tabletop games including Coleco Alien Attack, Bandai Galaxian, Mattel Classic Football, a Nintendo tabletop and even a dismembered GCE Game Time Watch. I was the type of kid who disassembled all of his toys. It was often enlightening when pulling apart an electromechanical game like Tomy's Blip or Atomic Pinball, but electronic devices were completely baffling because they contained a seemingly random assortment of integrated circuits. The idea of popping open an irreplaceable mint condition Nintendo Game & Watch seems too ghoulish to contemplate these days, so it's a good thing that the kind spooks at Handheld Museum have taken the time to document their autopsies for our viewing pleasure. Pinball has been a fading industry for several decades. Former industry giants Gottlieb, Bally, Data East, Chicago Coin and Williams are long gone. In fact, Stern Pinball, Inc. is the only manufacturer still producing machines in the USA (oddly enough, Gary Stern's latest company was founded in 1999, following the demise of all the major industry players). Greg Maletic's Tilt: The Battle To Save Pinball is a powerful new 60-minute documentary that explores the mysterious demise of Williams - the world's largest pinball manufacturer. The company faced a make-or-break moment in 1998 - they needed to create something radically new to survive. 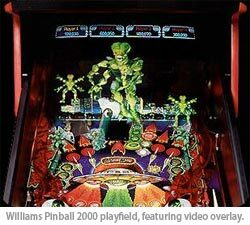 The designers put their heads together and came up with the revolutionary "Pinball 2000" system that fused pinball and video game technology into a single amazing unit. And then - inexplicably - the pinball division was shuttered in 1999 so that the company could focus on the lucrative slot machine industry instead. The film has been making appearances on the gaming show circuit and an excerpt will be shown at Vintage Computer Festival 10.0 in Mountain View, California this Sunday (Nov 4, 2007). 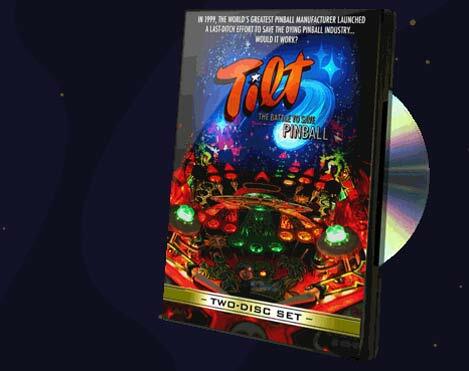 A $29.95 2-disc DVD set is available for pre-order from the Tilt site. It features over 3 hours of additional interview footage, a director's commentary track, the original Pinball 2000 promotional video and a video tour of the former Williams factory. The home video game world was dominated by ball-and-paddle games in the mid 1970s. The runaway success of Atari's Pong led to the release of dozens of clones. Most of them were built around custom chips from General Instruments that took care of the game play. In fact, the home game industry of 1976 was much like the modern MP3 player market, which offers hundreds of cheap Chinese players built around standard chipsets. The glut of Pong derivatives in 1976 made things extremely difficult for manufacturers such as Coleco and Atari - consumers were tiring of mindlessly simple paddle games. Atari's $100-million solution was the development of a fully programmable system, the 2600 Video Computer System. 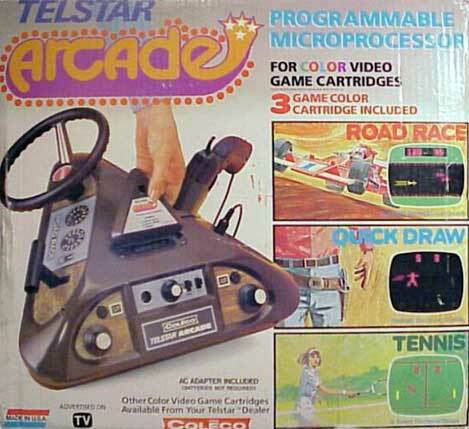 Coleco took a less risky route by introducing the unique 3-sided Telstar Arcade. Cartridges 2 through 4 were priced at $25 each. From a modern perspective, this seems like a remarkably limited lineup. However, Coleco's management seemed to share Atari's inability to visualize the potential of programmable home consoles - after all, only 9 titles (including Blackjack, Air-Sea Battle, Basic Math and other snoozers) were released for the Atari 2600 during its first year. Ultimately, quirky consoles like the Telstar Arcade couldn't compete with the versatility of microprocessor-based machines such as the Mattel Intellivision, Atari VCS and Magnavox Odyssey 2. Coleco eventually recovered with the introduction of the highly capable ColecoVision console in 1982, which sold like wildfire for a few short years in the early 1980s. Still, nothing can diminish the excitement I remember from spotting the Telstar Arcade in the Christmas 1977 Sears Christmas Wish Book. 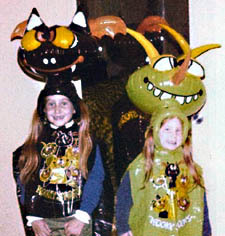 Back around Halloween 1979, I really felt like I'd graduated from the typical all-plastic costume-in-a-box to... um... another kind of plastic costume in a box. I remember a massive media blitz during local afternoon cartoon shows for Kooky Spooks - Halloween costumes that used beach ball technology. You could get one of a handful of Kooky Spooks characters. Each outfit consisted of the inflatable headgear, matching poncho, makeup to conceal the kid's face, and also (the commercials made a BIG deal of this) a ten cent piece of reflective tape all of three inches long. 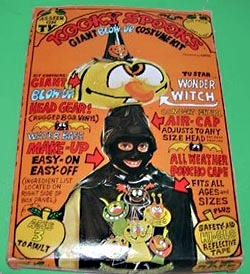 The commercials put Kooky Spooks forward as being safer than other costumes, The H.R. Pufnstuf proportions of the costume were super visible at night, using makeup instead of a mask meant unrestricted vision (though you can see the unintended blackface problem here...), and let's not forget to mention the life-saving scrap of reflective tape again. The costumes were popular in my grade school - I was "Spacey Casey" of course. My fellow Kooky Spooks and I realized that none of us were going to win the school's costume contest with our voluminous vinyl getups. The concealing makeup got itchy and cracked off as the day went on too (the next year Kooky Spooks returned with creamier makeup, and the crappy stuff was sold as ancient mummy makeup. Quick thinking, marketing department!). Kooky Spooks didn't stick around my neck of the woods very long. Kids either went back to the hard plastic costume-in-a-box, or they made their own. I'm surprised that no one has thought to bring back the safety-minded Kooky Spooks, given how sanitized Halloween has become. Now they'd probably include even more reflective tape and advertise how the outfit can be used as a flotation device. 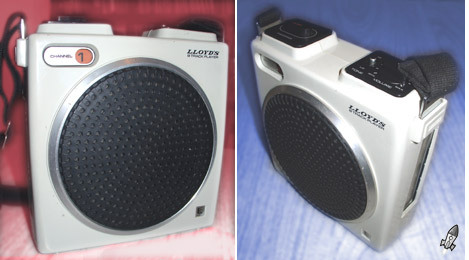 Lloyd's V128 8-track Player - iPod version .1? One unit is scarcely a replacement for the other, but it's interesting to see that these two devices placed 40 years apart aren't as far apart as one might think. Erasure and one-time Depeche Mode synthesist Vince Clarke is doing a little spring cleaning. 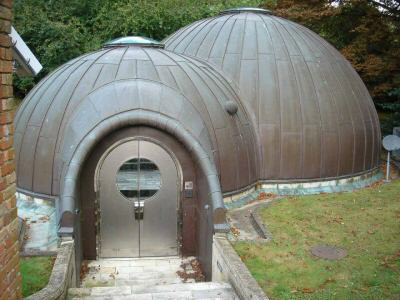 The truth of the matter is that everyone's favorite synth boffin now makes his home in rural Maine, so you're infinitely more likely to spot him bombing around in his Jeep Larado near the Damariscotta River than you are to run into him in his former suburban London home/bomb shelter/hobbit hole. There are some great Nintendo Entertainment System emulators for the PC, but the games just don't feel authentic using a keyboard or modern joystick controller. RetroZone's USB NES RetroPort ($22) solves the problem by adding an NES port to your computer. It's compatible with Win XP and 2K as well as Mac OS 9 and OS X. 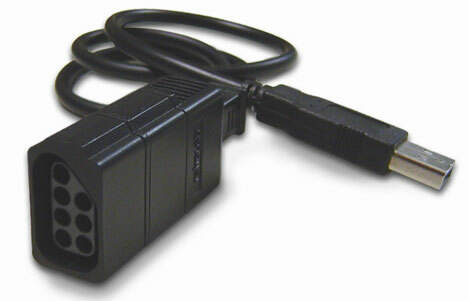 You can add a pair of RetroPorts for multiplayer fun, and it'll work with all standard NES controllers and clones. Sadly, it doesn't work with the Zapper. I guess I'll have to break out the real thing for my next Duck Hunt tournament. There's also a version for Super NES, also priced at $22. My only gripe is the price - the idea of forking out more than $5 to use my 20-year-old controllers just doesn't feel right. basic64 is a software synthesizer inspired by the renowned Commodore 64 SID sound chip. It's not an exact replica, offering extra flexibility and a distinctive pseudo-8-bit sound. basic64 includes 3 oscillators and the ability to select between 16, 8 or 6-bit sound quality. Other features include a unique 'subtle' pitch wobble option, ring modulation, hard oscillator sync, and a bunch of other cool stuff. The instrument includes 128 presets to get you started. It's absolutely free, so there's no excuse not to take it for a quick spin. Unfortunately, basic64 is only available as a Windows VSTi plug-in -- you'll need a flavor of Microsoft Windows and a VST-compatible music/audio sequencer such as Renoise to get started. If you're a laptop musician, this little beast is the perfect portal into chiptune nirvana. Come to think of it, there are now a handful of intruiging 8-bit software instruments include the Syntendo NES clone and Morgana, inspired by the 8-bit Ensoniq Mirage sampler. Don't forget to drop us a line when you release your 8-bit magnum opus. Back in the 1970's the Italian firm Olivetti built office gear with a distinct design ethos. Everything they made had a futuristic slant to it... and I do mean "slant". Designer Mario Bellini imbued many of Olivetti's signature pieces with a distinctive wedge shape. The bold silhouettes of many of his designs still look dramatic today. This is the Logos 7 from 1975, an early example of a pocket sized printing calculator. Besides contributing to the sleek look of the calculator, the wedge shape also made it easier to slip the unit in and out of pockets without getting snagged. This unit also features a fluorescent display in addition to the printer - many of the calculators of the day only had one or the other. It's easy to ask why one would imbue such a mundane appliance with such a high degree of design. Many people have to stare at their calculator for hours at a time, isn't it better for it to look sharp while doing it's job? I also think that it looks so good, that you might let it live on your desktop (this would look pretty slick next to a nice laptop, or maybe even an iMac?) rather than relegating it to the murk of your desk drawer. When faced with tough decisions, some high-priced executives turn to their crack staff of analysts and consultants. Others might go into hyper data-acquisition mode before generating a massive spreadsheet of all the facts. 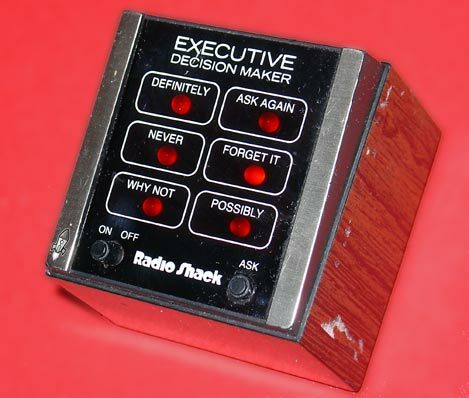 If you're a smart exec who wants to look calm and cool (and can't bear the thought of all of that data processing) just reach into your desk drawer and pull out this 1980's Executive Decision Maker from Radio Shack. The EDM is a roughly 2" cube, clad in the finest simulated walnut finish. Two switches unleash the Decision Maker's decisive power. One switch turns the unit on, the other launches the complex "random" algorithm and the determined ticking and bleeps that accompany every decision making process. Eventually the red LED indicator comes to rest in one of the six possible outcomes. Unless the answer is "ask again", you can simply slip the Electronic Decision Maker back into your mahogany desk and still make your tee time. I suppose that plebeians can get a similar determination by rolling a die or flipping a coin, but neither of those has fake walnut woodgrain or bear the legend; "executive". The only question remaining in my mind is whether this device has ever been used to actually make important decisions. It would explain a lot. We've gotten a lot of great response to our post a few days ago pointing to the great Scar Stuff blog and their album share of Sounds to Make You Shiver. We looked around the net for some more Halloween music and found another secret spot for spooky songs. Mostly Ghostly is bringing us a daily Halloween countdown of some creepy classics. Not only will you find music, but after scouring YouTube the blog has also unearthed some choice videos like "The Lurch" above. 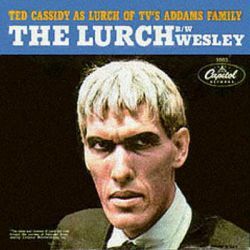 Lurch was played by the inimitable Ted Cassidy, whom you might also remember from his role as Ruk in the classic Star Trek. His intensely deep voice and laconic demeanor lent itself perfectly to this odd teen anti-dance tune. Here's video evidence that at last a few teenagers found a way to dance to the creaky, kookie and ookie strains of this undead butler. Trust the Germans to stretch mechanical sound reproduction to the limits of sanity. Optimal Media Production's VinylDisc features three minutes of vintage vinyl goodness on top of a standard 70 minute CD, enabling you to stage an 'analog vs. digital' comparison test in the comfort of your own home with only a single disc. It's a brilliantly silly gimmick that just might entice a few members of the digital generation into dabbling with turntables. I'm OK with that. 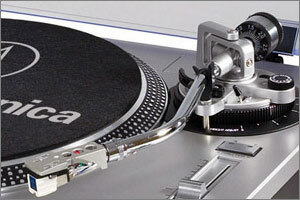 "The VinylDisc is a combination audio CD and special record. It consists of two attached layers. 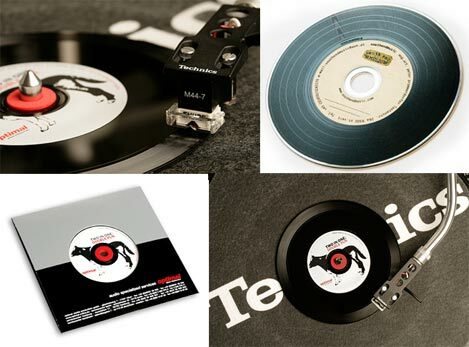 The silver layer contains digital audio information, while the black upper layer can be played on every record player. Physical discs are increasingly used as a marketing tool in the download era. More than ever, Optimal manufactures high quality exclusive audio CD releases and has also seen an enormous increase in vinyl manufacturing. Nothing could be more appealing than the idea of combining the worlds of digital and analog sound, apart from speeding down the Autobahn at 300 km/h in a borrowed Porsche [just checking to see if you're awake...]"
The company also makes a line of perfumed discs that enable you to imbue your latest dance album with the stench of stale beer, cheap cigarette smoke and sweaty half-dressed babes. Oh, the humanity. Yong Jieyu's minimalist CD player should serve as inspiration to gadget modders everywhere. What started life as a boring budget portable is now an unforgettable piece of art. I'd gladly adopt it in a heartbeat. "The speakers are put below the trumpet loudspeaker for amplification. The wooden box is made slightly more spacious then the electrical PCB board needed to achieve bass resonance. The laser pointer is shifted to the top allowing the spin of the CD to be clearly shown. 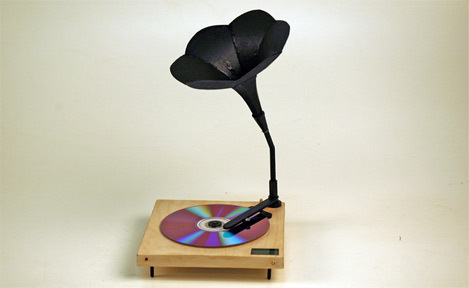 By bringing back a familiar nostalgic form of a phonograph, the design seeks transport the user back to the golden age of phonographs in early 1900s where sound broadcasting had a magical feel." The first thing my father ever microwaved was a bun. It was sometime in the mid 1980s, and he nuked the poor thing on high for a good ten minutes. The unfortunate result was a superheated chunk of beige charcoal. 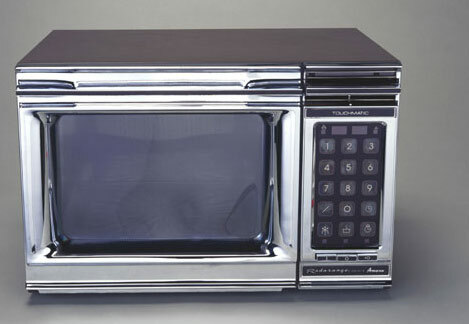 The microwave oven came about thanks to an accidental discovery by Raytheon Corporation researcher Percy Spencer shortly after WWII. I've been intending to write a brief history of the microwave oven for ages but never managed to get around to it. 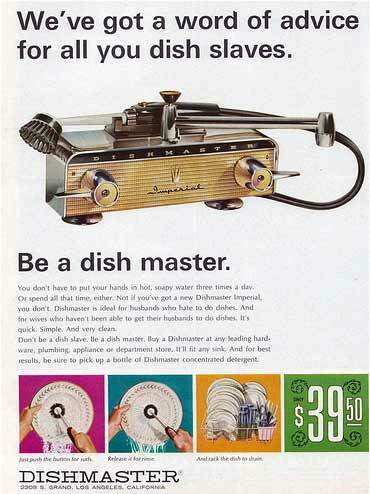 Luckily, Ron at I remember JFK recently penned an excellent piece exposing the history and myths behind one of the most useful gadgets ever to irradiate a kitchen. "The first Raytheon Radarange (the name was a winning entry in an employee contest) was built in 1947. It was 6 feet tall and weighed 750 pounds. It was also water-cooled and consumed 3000 watts of power. But research continued, along with gradual miniaturization, and by the mid 50's, free-standing ovens cost less than $3000. That made them affordable investment by eateries and bakeries, whose operations were revolutionized by the ability to cook much faster. As the technology got smaller and cheaper, Raytheon saw the potential for selling home-sized microwave ovens. So in 1967 Amana, a Raytheon division, began marketing the Radarange for $495."